This study examines social representations of teachership based on students’ and teachers’ drawings. Fifty-nine students and thirty-nine teachers in upper-secondary education in Finland participated in the research, drawing a picture of a typical teacher and commenting on their drawings verbally. The study focuses on what kinds of social representations of teachership the drawings suggest and how teachers’ and students’ social representations relate to each other and to Finnish education policy. The data were analyzed by content analysis. This study shows that teachers’ and students’ social representations of teachership differ from each other and also deviate from Finnish education policy to some extent. Furthermore, the results suggest that teachers do not pay sufficient attention to their visual nonverbal behavior, which might contribute to the formation of unfavorable social representations of teachers among students, influencing interaction and learning negatively. We live in a visual world and use visual elements to construct and communicate our understanding of it (Fleckenstein 2007). In social interaction, meanings are not communicated only verbally, but also visually through people’s visual appearance, as well as their nonverbal visual behavior, deliberately and undeliberately (Hess et al. 2008). In social perception, these situationally perceived elements merge with one’s prior experiences of social interaction and people acting in various social roles, as well as knowledge of cultural conventions regarding them (Balcetis and Dunning 2010; McArthur and Baron 1983). According to Moscovici (2001a), these conventions, norms, and rules make symbolic behavior possible. Cultural conventions regarding people’s visual appearance and behavior can be conceptualized as visual orders (Hester and Francis 2003; Seppänen 2006). Different times and cultures have different visual orders that create conditions for constructing, perceiving, and interpreting the visual (Seppänen 2006). Thus, visual orders mediate between the visual and the social. Occupations are surrounded by a number of normative expectations about people performing different kinds of jobs (Hedenus 2016). These expectations embrace visual characteristics as well, forming occupation-related visual orders of how people look and act in their occupational roles (Seppänen 2006). Clothes, work tools, and other workplace objects, for instance, become visual representations of occupations and their practitioners (Hedenus 2016). This sphere of visual orders, understood as visual common sense regarding people acting in various occupations, constitutes a part of culturally shared understanding that Moscovici (2007) conceptualized as social representations. Culturally shared visual orders influence teachers’ visual appearance and visual nonverbal communication, as well as people’s conceptions about them (Kamila 2012). Recently, several kinds of visual data have been used to explore both visual representations of teachership and cultural conceptions of teachership embedded in and represented through visual images. For instance, Beyerbach (2005) and Dalton (2010, 2013) studied representations of teachers in movies, whereas Bergman (2017), Cohen (2010), and Goldstein (2011) examined representations of teachers in the printed and popular media. These studies recognize various, often stereotypical, types of teacher representations in media and discuss their role in influencing the conceptions of teachers among the public at large. They also raise the need for more critical and nuanced teacher representations in the media. In addition, Beltman et al. (2015), Harrison, Clarke, and Ungerer (2007), and Kesiciogly and Deniz (2014), among others, have used participant-created drawings in researching teachership. Even though the participants of these studies varied from children to pre-service teachers, these studies share the notion that drawings may help to grasp the cognitive and affective factors influencing the relation to teachers and teachership. In Finland, for example, Miettunen and Dervin (2014) studied representations of teachers in a Finnish TV-series, noting that art teachers were represented in a more positive way than general teachers. Punakallio and Dervin (2015), for their part, focused on studying how teachers are represented in headlines and photos on Finnish tabloid front pages between 2000 and 2013, finding parallels between the changes in teacher representations and the changes in pedagogical thinking and conceptions of teachers’ status. In addition, several Finnish students of education sciences have utilized visual data in order to study teachership in their Master’s theses. For instance, Keskiväli (2012) and Nygren (2007) studied representations of teachers in Finnish films, recognizing gender differences in, often stereotypical, teacher representations. 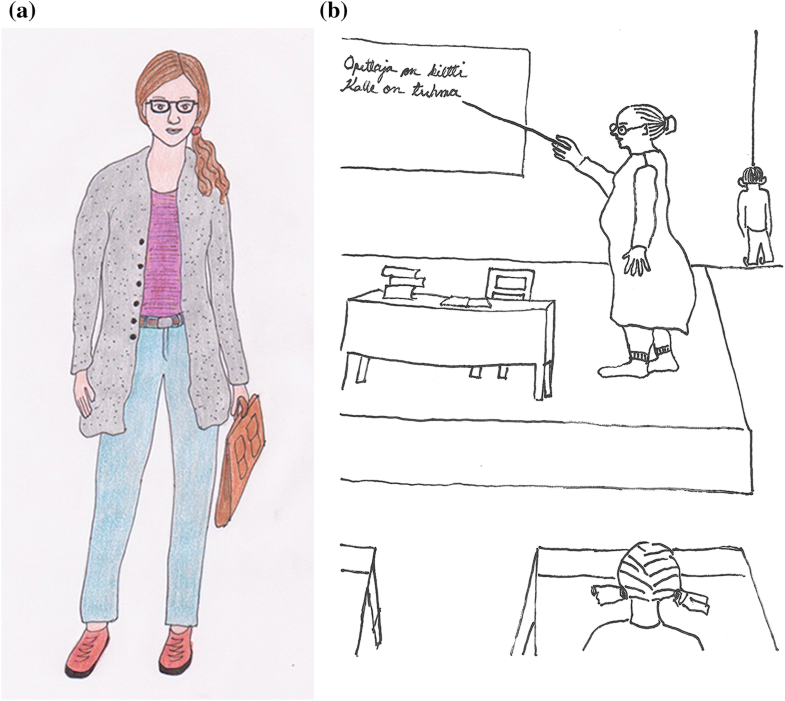 Hakaniemi (2014) integrated teachers’, students’ and pupils’ drawings of a teacher into her research on teachers’ visual appearance and found that visual appearance plays an important role in mediating ideas and values connected with teachers. Even though recent research has shown increasing interest in the visual dimensions of teachership and has also discussed their social implications, none of the above studies, for instance, applies social representations theory as its theoretical frame. Social representations theory could offer a theory that connects the visual nonverbal behavior to social understanding of teachership. By contrast, research on social representations of teachership based on verbal data exists (e.g., Minervini and Fontani 2003; Pardal et al. 2015; Rochira et al. 2015; da Silva 2012), but is not numerous, either. For this reason, teachers’ visual nonverbal behavior and communication from the perspective of social representations theory, as well as social representations of teachership based on visual data, can be identified as a research gap, which this study addresses. Social representations theory suggests that different social groups construct different kinds of social representations of the same target (Sakki et al. 2014). In addition, members of one social group, and even one individual, can have diverse and contradictory representations concerning the target, which Moscovici (2001a) characterizes as the polyphasic quality of common-sense knowledge. Following Moscovici’s (2001a) recommendation to compare social representations of various social groups in relation to the topic, and Bauer and Gaskell’s (1999) suggestion to select natural groups that in reality deal with the target of research, this study compares students’ and teachers’ social representations of teachership based on drawings. Consequently, students and teachers at the upper-secondary level of education in Finland were asked to draw a picture of a typical teacher and elucidate their drawings verbally. It will be examined what kinds of social representations of teachership these drawings suggest. Furthermore, this study explores how students’ and teachers’ perspectives relate to each other, as well as to Finnish educational policy, in which teachers are regarded as skillful and consultative educators encouraging and nurturing pupils’ and students’ personal growth (Kumpulainen 2014; Malinen et al. 2012; Räty et al. 2012). Finally, the results of the comparison will be discussed in terms of classroom interaction and learning. This procedure attempts to extend the analysis from understanding pictures to understanding social reality, which Sakki et al. (2014) set as the aim when studying social representations through visual images. Social representations theory is concerned with the ways members of communities produce and share knowledge through interaction and communication, and by doing so construct their social reality (Moscovici 2001a). Serge Moscovici introduced the term ‘social representation` in 1961 in his study of people’s common-sense understanding of psychoanalysis in France in the 1950s (Moscovici 2007; see also Duveen 2001). The social representations approach focused on examining how new and unfamiliar phenomena are made understandable and transformed into shared common knowledge, meaning social representations, through the processes of anchoring, objectification, and naturalization (Moscovici 2001a; Sakki and Menard 2014). Moscovici (2001a) defines social representations as popular knowledge and symbolic behavior that help members of communities orientate themselves in their material and social worlds and communicate about them with each other. He posited social representations at the crossroads between the psychological and sociological, the mental and social, emphasizing the primacy of the social in the formation of social representations. In this very quality, they provide an integrative approach to observing individual and social worlds as intertwined and mutually influencing each other (Abric 2001; Moscovici 2001a; Philogène and Deaux 2001). Moscovici’s theorizing on social representations drew on Emile Durkheim’s concept of collective representations, but he chose to use the term ‘social’ instead of ‘collective’ in order to emphasize the dynamic quality of social representations (Duveen 2001; Moscovici 2001a). Moscovici regarded social representations as phenomena in the process of constant reconstruction: when people make sense of their encounters by leaning on existing social representations, these representations do not remain unaltered but become modified (Moscovici 2001a). In addition, Moscovici (2001a) regarded knowledge as polyphasic, acknowledging that communities and individuals do not employ the same social representations consistently, but use diverse and even contradictory social representations, depending on the context. Social representations theory is not interested in texts and speech only, but also in visual images, since imagery is a central part of social common sense, today even more than earlier (Sakki et al. 2014). Moscovici (2001a) himself argued that the core of social representations is figurative, consisting of a group of images. In addition, he regarded pictures as compressed social representations reflecting cultural meanings deeply rooted in the norms of a social group and taken as self-evident (Räty et al. 2012; Sakki et al. 2014). For this reason, images can reveal information on social representations that is not expressed verbally or consciously, or whose expression is socially undesired (Räty et al. 2012; Sakki et al. 2014). De Rosa and Farr (2001) and de Rosa (2014), for their part, consider images to be interesting because they can be understood as sources activating social representations, products expressing social representations, and tools spreading social representations. Even though social representations research has mostly used verbal data (de Rosa 2014), Moscovici (2001a) regarded the visual as an essential constituent of social representations from the very beginning. Recently, visual materials have gained increasing attention within social representations research (Hakoköngäs 2017; Hedenus 2016; de Rosa 2014; Sakki et al. 2014), since images are considered as important in terms of both shaping and investigating social representations (de Rosa 2014). Among others, Milgram and Jodelet (1976), de Rosa (1987), and Räty et al. (2011, 2012) used participant-created drawings as material for studying social representations. It has been argued that visual materials may give insight into unconscious and emotional layers of common sense that are difficult to articulate verbally (Sakki et al. 2014; de Rosa 2014). It is important to study these dimensions, since social representations influence social interaction (Philogène 2001). This research studies social representations of teachership. Teachership cannot be considered as the sort of new or unfamiliar phenomenon in which the social representations approach was initially interested (Moscovici 2001a). However, as Hakoköngäs (2017) and Sakki and Menard (2014) suggest, the social representations approach can be used to study conceptions and phenomena already naturalized in the culture that we take for granted. In order to make students’ and teachers’ social representations of teachership accessible, they were asked to draw a picture of a typical teacher and elucidate their drawings verbally. The acts of visualization and verbalization were associated with the act of objectification, materializing social representations of teachership (see Sakki and Menard 2014; Hakoköngäs and Sakki 2016). 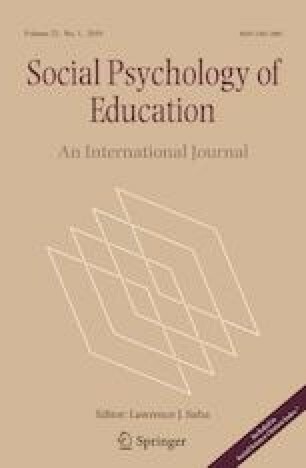 This study understands drawings and verbal accounts as visual and verbal objectifications materializing social representations of teachership and reflecting the core elements of these social representations that direct thoughts, perceptions, and actions in relation to teachers (see Abric 2001; Moscovici 2001a). From the social representations theory point of view, the aim of this study is to explore and compare students’ and teachers’ common-sense understanding of teachership through their drawings, as well as to trace the core notions influencing their conceptions of teachership. The students and teachers participating in this research came from the context of upper-secondary education in Finland. Fifty-nine students (47 female, 12 male) in a vocational upper-secondary college for culture studies participated in the research. Their age varied between fifteen and 42 years old, but the majority of them were between 15 and 20 years old. The group of participants included students majoring in visual arts, photography, audio-visual communication, textile and garment design, and carpentry. They were students on three courses on visual culture studies taught by the researcher of this study. Approximately half of them were first-year students who had just started their studies in the college, and half of them were third-year students. By including freshmen in the group of participants, this study intended to make sure that the drawings of a typical teacher are not too much influenced by the observation of teachers in their current school. Except for one, all the students were Finnish. The sample represents the typical distribution of students in the college in terms of age, gender, and study program. In addition, 39 teachers (26 female, 13 male) of various subjects from a number of upper-secondary schools and vocational colleges from Eastern and Southern Finland participated in the research. The researcher inquired about the willingness of the teachers in these upper-secondary schools and vocational colleges, including the college where he is employed, to participate in the research via the Internet. Those who volunteered were sent the research material. Their age varied between 28 and 60 years old. All the teachers were Finnish. The data for this research were collected in autumn 2015. The students and teachers were asked to draw a picture of a typical teacher and comment briefly on their drawings in writing. No further instructions were given. The instruction read: “Draw a picture of a typical teacher and write briefly what makes it a picture of a typical teacher. You may use colors if you wish so.” The students produced the data at their college during the lessons on visual culture studies. A period of 45 min was reserved for them to accomplish the assignment. It took approximately 15 to 30 min for them to complete the assignment. They were provided with paper, pencils and colors. All the students accomplished the assignment willingly. The teachers received the assignment via e-mail. They drew the pictures when convenient to them and sent them with verbal comments via e-mail to the researcher. The data consisted of 59 students’ and 39 teachers’ drawings, representing a typical teacher. In addition, students and teachers elucidated their drawings verbally. The length of students’ verbal comments varied from a couple of words to a maximum of ten sentences, whereas the length of teachers’ verbal accounts varied between two and fifteen sentences. Participant-created drawings were the primary data, and the role of the verbal data was to elucidate the drawings. This choice was motivated by research showing that visual materials may encourage participants to express their lived experiences and issues they might not express verbally (Mannay 2016). Furthermore, visual materials may reveal tacit conceptions as well as emotional experiences (Banks 2008; Rose 2014). In fact, Mannay (2010, 2016) argues that visual materials may have the potential to make the familiar strange again by involving participants in observing and reflecting on social phenomena from an unusual perspective. Since pictures are created from a number of motivations not detectable by observing the visual expression alone, the participants were asked to write about their drawings as well (Mitchell et al. 2011; Rose 2014). Within the frame of social constructionism, drawing pictures can be understood as a process of visual sense-making, interlacing subjective experiences with social and cultural practices (Clark and Morris 2017; Mitchell et al. 2011). This study applies qualitative content analysis in analyzing students’ and teacher’ drawings and verbal accounts. By doing so, it joins the strong tradition of qualitative research and content analysis in research on social representations (Sakki et al. 2014). As is typical of content analysis, it is used in this research to detect and classify meanings and themes from the data (Krippendorff 2004). In practice, the analysis focused on detecting inductively what types of teachers the students’ and teachers’ drawings and verbal accounts suggest (see Hughes et al. 2016). The teacher types detected from the data were considered to reflect the participants’ social representations of teachership (see Moscovici 2001a). Visual content analysis is based on what is directly visible in the image. Identifying these visual characteristics constitutes the basic procedure of the analysis (Johnson and Christensen 2013). However, there are some difficulties in conducting content analysis in visual material. Firstly, as Rose (2016) points out, such analysis is generally based on very subjective assessments. Secondly, quantification of individual visual elements simplifies the image, since they do not exist as separate elements but interact with each other and modify each other’s meanings (Hedenus 2016). On the other hand, the visual material can be made more accessible for analysis through quantification (Bock et al. 2011). Bearing these limitations in mind, the results of quantification should be understood as tendencies detected in the visual data rather than capturing them, per se, explicitly (Hedenus 2016). At first, the drawings were analyzed without reading the participants’ verbal accounts. In this way, the researcher wanted to observe the visual characteristics of the teachers drawn as well as to examine what types of teachers they suggested, without being influenced by the participants’ verbal accounts. When typifying visual teacher representations, attention was paid to facial expressions, gestures, postures, clothes, hair styles, backgrounds, and environments. In addition, it was observed whether students were included in the drawings. This stage of analysis was followed by the analysis of the verbal data, in which the researcher focused on detecting the types of teachers explicated verbally. After this initial typification, the visual features of the drawings, as well as their verbally expressed characterizations, were quantified. The purpose of quantification was to evaluate the appropriateness of the initial findings, as well as to find out whether any type of teacher was predominant in the data (see Hedenus 2016). Finally, the analyses of visual and verbal data were compared with each other in order to observe the drawings in the light of participants’ verbally expressed intentions. The procedure of analyzing the visual and verbal data first separately and only afterwards in relation to each other was motivated by the aim of exploring whether the teacher types detected in the visual and verbal data produced by each participant were consistent. In addition, this study design aimed to trace the tacit dimensions of social representations that the visual is supposed to bring forth (Sakki et al. 2014; de Rosa 2014). The types of teachers detected in the students’ and teachers’ data deviated to some extent from each other. For this reason, the findings of students’ and teachers’ data will be presented separately. On the other hand, the comparison of the visual and verbal data produced by students and teachers showed that similar types of teachers were depicted visually and verbally. Consequently, the findings from the visual and verbal data will be presented together, commenting on and elucidating each other. Forty-two students depicted a typical teacher as a woman and fourteen students as a man. All the male students depicted a typical teacher as a man. Except for two, all the female students depicted a typical teacher as a woman. 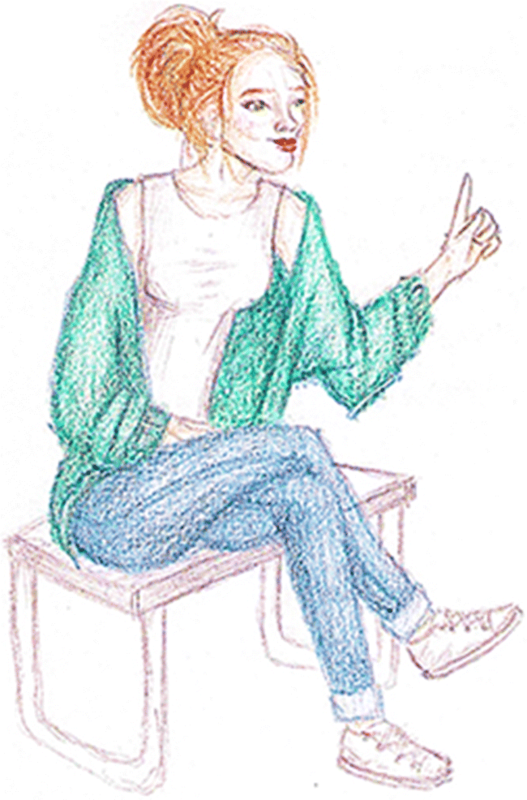 In addition, three students depicted a typical teacher as androgynous. The majority of teachers were depicted frontally, looking toward the spectator; the rest of them were looking past the spectator and turned slightly sideways. Even though it is challenging to estimate the teachers’ age in the drawings, a vast majority of them looked middle-aged. Only some of the teachers looked distinguishably young or old. Female teachers were mostly depicted wearing ordinary and appropriate clothes. The majority of them wore trousers, a cardigan or jacket, and a blouse. Female teachers with more formal clothing wore a dress or a skirt and a piece of jewelry. The majority of female teachers had a shoulder-length bob haircut. Far less common was short hair or hair tied in a bun. Except for one, all the male teachers were depicted wearing casual but appropriate clothes consisting of a shirt and trousers. They had a short hair-cut and most of them had a beard. A total of thirty-nine teachers wore spectacles, which turned out to be the most common visual element characterizing a teacher. Another common visual element was a key strap hanging around the neck. No student drew students or pupils in the picture, only the teacher. Three clearly distinct types of teachers were detectable in students’ visual and verbal data, which constitutes the main result regarding the students’ data. These types were, in order of frequency, a formal and authoritarian teacher, a bored and indifferent teacher, and a friendly and communicative teacher. Because same types of teachers were detected in both visual and verbal data, these results are intertwined in the presentation. However, since almost all the female students depicted a typical teacher as female and all the male students depicted a typical teacher as male, with slightly different overtones compared to teacher types detected in female students’ drawings, both female and male students’ drawings are presented below, in order to elaborate the data landscape. In the drawings, a vast majority of the teachers were depicted standing and holding their hands at their sides or clasped in front of their stomach. Their facial expression was serious and they wore formal, appropriate, and tidy clothes. In their verbal accounts, some students thought this kind of visual appearance was deliberate in order to create an impression of authority. Whereas some students considered the impression of authority to be positive in terms of maintaining order in class, several students regarded the authoritarian type of teacher as strict and even frightening. This type of teacher was assumed to keep an eye on students’ mistakes, as well as to criticize them. Thirteen students identified a typical teacher as tired or bored, characterized by a dull facial expression, casual clothes, and a slack overall appearance. According to students’ written reflections, these visual characteristics were intended to communicate a teacher’s lack of initiative and indifference in relation to students. Some students saw teachers’ tiredness as resulting from stress, a busy timetable, and work overload. Furthermore, they assumed tiredness and boredom might be due to challenging students who don’t seem to learn and achieve study goals. Seventeen teachers were depicted with a hint of a smile. However, in their verbal accounts, the students did not always describe the smile as welcoming but as evaluating. In all, only eight students considered a typical teacher to be a person who is friendly and welcoming, ready to give advice and help students. The most important visual cue communicating friendliness was a smile. In addition to a smile, the students expressed these teacher qualities with relaxed clothes and warm colors. Furthermore, friendly and welcoming teachers were depicted in a relaxed posture referring to an act of communication, for instance, stretching their hands towards the spectator. In their written accounts, nine students identified the influence of their previous teachers, and two students identified the influence of films and media on their visual conception of a typical teacher. Some of them wrote that they had combined the characteristics of various teachers in their visual representations, whereas others recognized one single teacher, in the early stage of their school education, as affecting their conception of a typical teacher. When looking at her drawing afterwards, one student realized, to her surprise, that it was unintentionally reminiscent of her previous teacher. It seemed that conceptions of a typical teacher’s visual appearance sometimes emerged from unconscious layers concretizing and visualizing tacit knowledge. Summarizing the female students’ drawings and verbal accounts, a typical teacher was female. In their verbal accounts, the majority of students described teachers’ visual appearance as communicating their teacher characteristics. The same three types of teachers emerged from the visual and verbal data. The most frequently depicted type was a serious- or strict-looking, appropriately and neutrally dressed teacher, who stood in a stiff posture with their hands hanging at their sides or holding books and papers. She did not show any signs of activity or communication. This type of teacher was described as formal and authoritarian (Fig. 1). The second type of typical teacher was a bored or tired-looking teacher who seemed to lack both interest and energy, and whose posture expressed indifference and unwillingness to communicate (Fig. 2). The third, and least common, type was a smiling teacher who looked welcoming and was experienced as friendly. 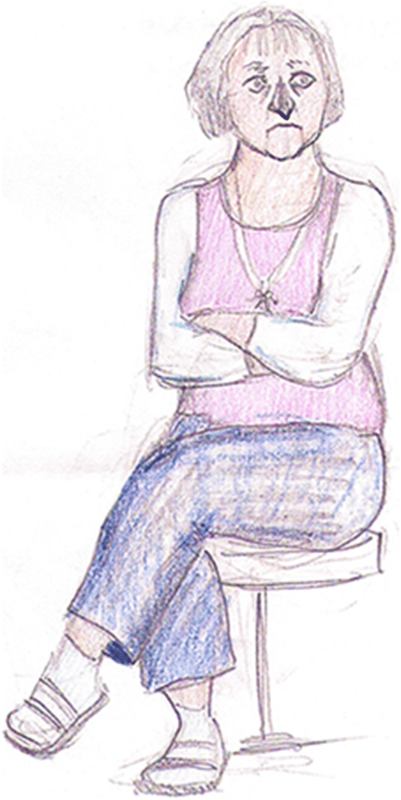 She wore more casual clothes and her posture and gesticulation referred to communication (Fig. 3). Interestingly, all the male students depicted a typical teacher as a man. Basically, the same types of teachers emerged from the male students’ drawings as from the female students’ drawings. Slightly differing from them, the formal and authoritarian teacher was depicted as more strict (Fig. 4), the bored teacher as tired and exhausted under their workload (Fig. 5), and the friendly teacher as more humorous (Fig. 6) than in the female students’ drawings. The types of teachers detected from the data each valorize a different kind of teachers’ interactional position towards students. Authoritarian, indifferent, or friendly types of teachers suggest various kinds of relationships between teachers and students. Based on this notion, the type of teacher–student relationship can be regarded as the core notion of the participating students’ social representations of teachership. Of the total of thirty-nine teachers, twenty-three teachers depicted a typical teacher as a woman, eight as a man, and eight as androgynous. Both female and male teachers drew pictures of female and male teachers. Thirty teachers drew a black-and-white picture, three teachers used moderate colors, and six teachers used bright or dark colors. No teacher explicated verbally any colors communicating certain teacher characteristics. However, one gets a feeling that moderate color choices accompany the ordinary looks of teachers. Twenty-five teachers drew a full-body picture, and seven teachers drew a torso and face, whereas the remaining seven teachers drew only the face of a typical teacher. In their verbal accounts, one teacher said that a close-up deliberately communicated the warm and caring personality of the teacher. When it comes to age, the majority of teachers looked middle-aged. Both female and male teachers were depicted wearing appropriate but casual clothes. Most female teachers had a shoulder-length bob haircut, but some of them had their hair tied in a bun or ponytail. Male teachers’ haircuts were short. Fewer than half of the teachers in the drawings wore spectacles. Typically, the drawings depicted only a teacher in the picture. Deviating from this, eight teachers included pictures of students in their drawings. In all of these drawings, the classroom setting was traditional, with the teacher teaching by the chalkboard and the students sitting at their desks. Three types of teachers were distinguishable in teachers’ visual and verbal data. In the order of frequency in the visual data, these types were an expert teacher, a social and multitasking teacher, and a friendly and communicative teacher. Because the same types of teachers were detected in both visual and verbal data, these results are intertwined in the following presentation. Since the expert type of teacher was depicted either alone or with students, this type will be elucidated with two drawings (Fig. 7a, b). However, when writing about the drawings, the majority of the teachers did not pay any attention to the teacher’s visual characteristics at all, and did not explicate the visual features as expressing certain social characteristics or teacher qualities. Eleven teachers described both visual and social cues, but did not necessarily articulate visual features as signs of certain teacher characteristics. As a result, the majority of verbal comments characterized a typical teacher at a more general level without becoming explicitly anchored to the drawings. For this reason, the drawings brought out shades of teachers not identifiable in the verbal comments. This is something that clearly differs from the data produced by the students, who articulated visual elements as expressing certain teacher characteristics. The majority of expert teachers were depicted standing still without reference to any particular activity. Typically, they had a serious facial expression, but some of them could be interpreted as angry, stressed, or tired, as well. These teachers wore tidy, neutral, and appropriate clothes. Typically, they carried a briefcase, books and papers, or a pointer indicating their role as a knowledgeable teacher. Another type of expert teacher detected in the visual data was a traditional instructor who stood by the chalkboard and taught pupils who sat at their desks turned toward the teacher. This kind of classroom situation and setting clearly visualized a teacher-centered way of teaching based on one-way communication and delivery of information. Interestingly, the participants depicted small children, or pupils, instead of students in their drawings, even though they themselves worked in the upper-secondary level of education. Even though this type of teacher was depicted in drawings most frequently, less than one-third of the teachers commented on expertise verbally. In the verbal accounts, expert teachers were described as knowledgeable and eager to educate themselves further. They were confident, appreciating their knowledge and skills acquired through education and experience. In several comments, this kind of teacher appeared as a role model of a good and responsible citizen. Interestingly, only one teacher’s verbal account can, indirectly, be understood as characterizing an authoritarian teacher or teacher-centered way of teaching, even though this type of teacher was much more often distinguishable in the drawings. The second type of teacher detectable in the visual data was an active, social, and extrovert multitasker. The teacher was depicted busy doing a number of things simultaneously or multitasking between several roles. Drawings representing this type of a teacher did not realistically depict a teacher and their visual features. Rather, teachers harnessed their visual expression to metaphorically visualize their experience and knowledge of the profession. For instance, teachers had several hands or legs in order to cope with the challenges. 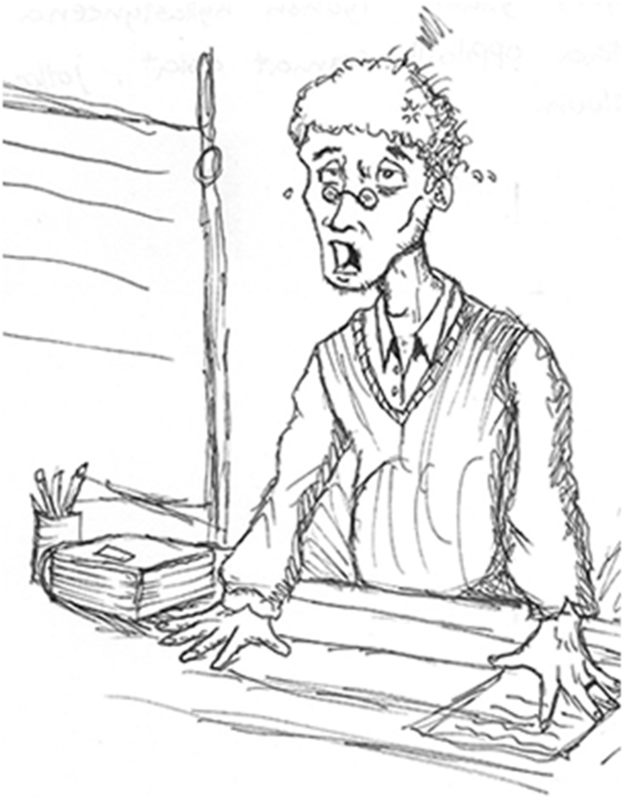 In teachers’ verbal accounts, this type of teacher was the most frequently identifiable. The teacher was considered as someone who is and has to be very versatile, multitalented, and active in order to meet the challenges of their profession. 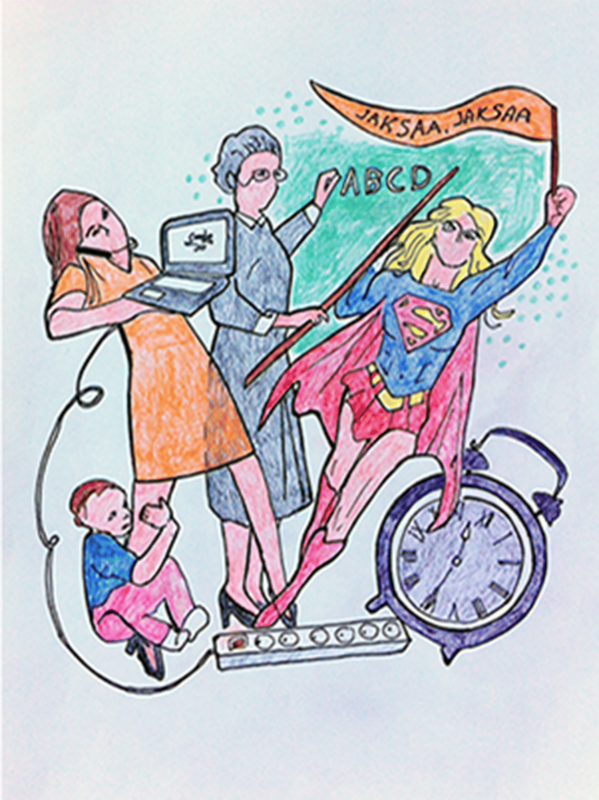 Many of them described a typical teacher as a superwoman or superman multitasking and zigzagging between various roles. This teacher type was represented in the visual data as well. The needs of versatile students, constant technical development, and the requirement to update one’s knowledge and skills in a nonstop manner painted a picture of a teacher who tries to navigate between a plethora of challenges. A characteristic feeling of a typical teacher seemed to be inadequacy in terms of fulfilling the expectations and requirements that the constant change in the work environment and students’ increasing challenges set. The third type distinguishable in the data was a friendly and communicative teacher. This type of teacher was notably more often detectable in the verbal than the visual data. The most obvious characteristic in the drawings mediating this type of teacher was a smiling face. In addition, these teachers often gesticulated with their hands, suggesting a greeting or interaction in general. However, the overall impression of these teachers was often cautious, sometimes even inactive. In the verbal comments, this type of teacher was characterized as a friendly and caring educator. The teacher was commonly characterized as having good social and communication skills. Teaching emerged as collaboration and teamwork including not only students and colleagues but also parents and others. A friendly and caring educator could be characterized as a servant teacher, whose orientation to teaching is student-centered. The student emerged as a customer with personal needs, motivations, and strengths, which formed the basis for instruction and interaction. In summary, three types of teachers emerged from the teachers’ data. One of them can be identified as an expert teacher depicted as a serious-looking, appropriately dressed teacher either standing still without any reference to communication and the school environment, or teaching pupils in the front of the classroom (Fig. 7a, b). In the verbal data, this type of teacher was characterized as knowledgeable and capable of meeting the requirements of their profession based on education. However, the authoritarian and teacher-centered type of expert teacher identifiable in the visual data was not directly explicated in the verbal data. The second type depicted a social and multitasking teacher balancing different roles as well as a range of challenges (Fig. 8). This type of teacher was the most commonly characterized in the verbal data, constructing an image of a social, dynamic, and efficient teacher who, on one hand, aims to meet the challenges of the profession and, on the other hand, feels inadequate and tired in the middle of them. The third type can be characterized as a friendly and communicative teacher, expressed through a smile and greeting gestures in the drawings (Fig. 9). In the verbal accounts, this type of teacher was regarded as caring and welcoming, focusing on the needs of students. The types of teachers detected from the teachers’ data suggest three core notions of social representations of teachership. The first two of these can be characterized as expertise based on education and a challenging profession. The third core notion can be identified as pedagogy. The findings based on visual and verbal data are controversial: while verbal accounts emphasized student-centered and consultative pedagogy, a number of drawings suggested a more teacher-centered pedagogy. Despite the unique features of each drawing, both students’ and teachers’ drawings clearly shared characteristics forming distinguishable types of teachers, which can be interpreted as the influence of socially constructed and culturally shared conceptions of teachership (see Räty et al. 2012; Sakki et al. 2014). Thus, the drawings functioned as means of objectifying social representations of teachership visually (Sakki and Menard 2014). In the students’ data, three kinds of representations of teachership were identified. Students’ drawings and verbal reflections elucidating them constructed social representations of teachers as being, in order of frequency, formal and authoritarian, bored and indifferent, or friendly and communicative. The same social representations were identifiable in both visual and verbal data. The way of interacting with students can be crystallized as the core of social representations of teachership in the students’ data. When taking all the participants’ data into account, social representation of teachership was not gendered, since both female and male teachers were drawn. However, when female and male students’ drawings are observed separately, social representation of teachership seemed to be gendered, since all the male students drew a picture of a male teacher, and except for two, all the female students drew a picture of a female teacher. This is an interesting finding that cannot be explained by the data and the setting of this research, and it should be studied further in the future. In the teachers’ data, three kinds of representations of teachers were identified as well. They constructed social representations of teachers as knowledgeable experts, social multitaskers, and friendly communicators. While expertise was emphasized in the visual data, facing multiple challenges was the most frequently discussed topic in the verbal data. Based on these findings, expertise based on education and a challenging profession were identified as the dominant core notions of teachers’ social representations of teachership. In the third core notion, pedagogy, visual and verbal data seemed to suggest different approaches. On one hand, verbal data pointed towards student-centered, consultative pedagogy, and on the other hand, visual data pointed more strongly towards teacher-centered pedagogy. The analysis of the verbal data revealed that most teachers neither reflected on teachers’ visual features in the drawing at all nor mentioned teachers’ visual cues as communicating teachership qualities. In addition, the contents that the teachers expressed in writing did not quite match their drawings. Furthermore, a number of teachers did not depict teachers realistically, but expressed experiences and knowledge of the profession metaphorically in an unrealistic manner. These findings create the impression that the teachers did not pay conscious attention to the messages conveyed by their teacher images or did not regard teachers’ visual features as communicating certain teacher characteristics. Interestingly, social representations of teachership detected in the teachers’ verbal accounts correspond to the definitions of official educational policy in Finland that emphasize the role of teachers as knowledgeable, skillful, and consultative educators encouraging and nurturing pupils’ and students’ personal growth (Kumpulainen 2014; Malinen et al. 2012; Räty et al. 2012). However, visually mediated social representations of teachers being serious and neutral, or even angry, as well as teacher-centered authorities, clearly deviate from the official policy. This notion further supports the conclusion that verbal accounts were constructed more consciously than drawings. Consistent with the research on the potential of participant-created drawings to tease out tacit conceptions and experiences (Mannay 2010, 2016), it seemed that teachers’ drawings expressed tacit and hidden, or even silenced and politically incorrect, social representations of teachership. In contrast, students’ data showed that they paid careful attention to the visual expressiveness of their teacher images. They regarded teachers’ visual appearance as referring to certain teachership qualities and as meaningful in terms of interaction. Even though this study examined social representations of teachership and not teachers’ performance in actual classroom situations, one is tempted to ask whether this notion also applies to actual classroom situations. If teachers do not pay conscious attention to their visual nonverbal behavior and visual appearance when teaching, and if students interpret teachers’ visual nonverbal behavior as intentional, problems may arise. In fact, this is exactly what prior research has shown: on one hand, teachers do not pay sufficient attention to the visual dimensions of teachership, and on the other hand, students observe teachers and pay attention to their visually communicated messages (Ambady and Rosenthal 1993; Babad 2009; Quigley 2016). The representations of ‘formal and authoritarian teacher’ and ‘bored and indifferent teacher’ identified in the data were based on teachers’ negative visual expressiveness that is shown to have negative impact on student motivation and study performance (Babad 2009; Riniolo et al. 2006). In contrast, the representation of ‘friendly and communicative teacher’ was based on teachers’ warm and enthusiastic visual nonverbal behavior that is associated with increased student motivation and better study achievements (Babad 2009). Since teachers’ visual nonverbal behavior influences the classroom climate and has an effect on student motivation, as well as study performance (Babad 2009; Riniolo et al. 2006), it should be regarded as an essential component of teachers’ pedagogical competence and more attention should be paid to in teacher education. The variety of social representations of teachership detected in the data is understandable in terms of the polyphasic quality of common-sense knowledge (Moscovici 2001a), suggesting that social groups and individuals can have multiple, even contradictory, social representations of the same target. However, it attracts attention that students’ and teachers’ social representations of teachership differed from each other to such a notable extent. Teachers’ representations of enthusiastic, active, social, and multi-talented teachers are more or less non-existent in students’ representations of teachers, and strongly deviate from students’ visual depictions of teachers who stand in a stiff position and look formal, tired, or bored. The lack of enthusiastic, social, and active types of teachers in students’ data may be due to the fact that the teachers’ job includes a lot of preparation and other duties outside the lessons that are not visible in the classroom. However, since social representations are based, in addition to cultural and social conventions, on people’s own experiences (Moscovici 2001a), this result may also refer to students’ experience that, in practice, teaching is not always as student-centered and consultative as official educational policy suggests. When comparing the students’ and teachers’ data, one is tempted to see another explanation for the difference in the data set as well. Perhaps there could be a relation between the social multitaskers identified in the teachers’ data on one hand, and the tired, indifferent teachers identified in the students’ data on the other hand. Perhaps this finding could be interpreted so that students perceive in class the outcome of the challenging profession, namely, an exhausted teacher who is busy with a number of challenges outside the classroom but too tired to put full energy into classroom teaching, including the management of messages conveyed by their visual nonverbal behavior. The findings of numerous studies on teacher stress (e.g., Collie et al. 2017; Pyhältö et al. 2011) support this interpretation. In addition, research shows that the burnout level among teachers in Finland is higher than in other human services and white-collar jobs (Hakanen et al. 2006). Social representation theory offers one further explanation for the emergence of the social representation of a typical teacher as being formal and authoritarian. Structurally, social representations can be divided into central and peripheral elements. Central elements constitute the core of social representations evolved over a long period of time and incorporating deep-rooted, cultural conceptions of objects and phenomena of the material and social world. These central elements tend to resist change and direct perceptions in accordance with cultural conventions (Abric 2001). Even though student-centeredness, equality, and a narrow power distance are current ideals in the Finnish educational system (Räty et al. 2012), this change has occurred little by little over the course of past few decades. Before that, there was a long tradition of teacher-centered school education in Finland, where teachers were authorities (Räty et al. 2012), which could explain the emergence of an authoritarian teacher among social representations of teachership in this research. In addition, the authoritarian type of teacher is a common character in a number of Finnish works of art, such as Aleksis Kivi’s widely known and iconic Finnish novel “Seven Brothers,” featuring a strict and authoritarian teacher who tries to teach the stubborn brothers how to read. This imagery of a strict teacher is widely known and circulated by Finnish painters, film-makers, and book illustrators. Since media and other imagery play an important role in forming and spreading social representations (Moscovici 2001a), perhaps the image of an authoritarian teacher circulated in both Finnish works of art and media has become a part of Finnish people’s common-sense understanding of teachership. This could explain the depictions of an authoritarian teacher with traditional emblems of teachers, such as chalkboards, pointers, and globes, but not computers, laptops, and iPads, for instance, which teachers use in contemporary classrooms. In summary, the results of this research revealed a discontinuity between students’ and teachers’ social representations of teachership. In addition, students’ and teachers’ social representations of teachership deviated from the guidelines of Finnish educational policy. The results of the analysis suggest three outcomes. Firstly, teachers did not seem to regard the visual expressiveness of teachers as being as important as verbal expressiveness, or they did not pay conscious attention to the meanings communicated by teachers’ visual features. This is problematic, since students paid attention to the visual appearance of teachers as well as their visual nonverbal behavior, and made inferences based on them regarding the interaction between the teacher and students. Secondly, the emergence of the formal and authoritarian type of teacher in the teachers’ visual data, as well as in the students’ visual and verbal data, seems to suggest that student-centered teaching is not rooted in everyday teaching practices to the extent that official educational policy in Finland suggests. Thirdly, the results raise the need to critically discuss and study further whether teachers are able to invest sufficient resources in the actual pedagogical interaction itself, including its visual dimension, when confronted by a plethora of challenges. There are both strengths and limitations regarding this study. First, the visual approach to studying teachership, characterized by both the inclusion of visual nonverbal behavior of teachers and participant-created drawings, diversifies the scope of prior research on the topic. Similarly, the study design, in which researcher-driven analysis of drawings is combined with analysis of drawings based on participants’ verbally explicated intentions, can be regarded as a strength, since it provides an opportunity to trace the participants’ tacit conceptions of teachers. In addition, social representations theory gives a novel perspective for discussing the visual dimension of teachership in relation to social interaction. The students participating in this research studied in an upper-secondary vocational college for culture studies in which visual skills are trained extensively. Therefore, they might have better than average visual skills, being able to produce visually rich data. On one hand, this can be regarded as a strength of this study. On the other hand, it may be a limitation as well, since students with other study orientations may be neither as skilled in visual literacy nor as used to expressing themselves visually. It must also be noted that this research was carried out in Finland. All the participants, apart from one student, were Finnish. In addition, the participants in this study were students and teachers in upper-secondary education, characterized by specific goals differing from other levels of education. Since social representations and visual orders are culturally specific (Moscovici 2001a; Seppänen 2006), the results may vary in other cultural or educational contexts. Despite common official policy and principles of education in Finland, individual schools may also have local educational cultures contributing to the nature of social representations of teachership. Thus, when students’ and teachers’ social representations of teachership are compared in this research, it must be taken into consideration that they come from a number of schools. For the aforementioned reasons, the results of this research cannot be statistically generalized. In the future, it would be interesting to conduct similar research in other settings as well, and to compare the results with the findings of this study. The fact that students’ social representations of teachership included such aspects as formality, authority, lack of communication, and boredom does not benefit learning, regardless of the reason for these representations. Social representations actualize a certain kind of relationship between people and their social world (Moscovici 2001a), which includes the dimension of attitudes (Sakki et al. 2014). Social representations influence people’s behavior toward each other, as Moscovici (2001a, p. 28) claims “people become fashioned in relation to social representations.” The way in which teachers are represented socially shapes the way we think of and act toward them. Negatively valenced social representations of teachership may have a negative impact on social interaction between students and teachers as well as on learning. In contrast, positive social representations of teachership may motivate students and contribute to their study performance positively. (Babad 2009; Riniolo et al. 2006) Pedagogically appropriate and positively valenced teachers’ nonverbal visual behavior may advance not only learning but also interaction between students and teachers, which in turn may decrease teachers’ fatigue and promote job satisfaction. Moscovici (2001a) conceptualized social representation as a phenomenon in which people make sense of their encounters with the social and material world by fitting them into prevalent social representations (see also Philogene and Deaux 2001). It should not be forgotten that, when teaching, teachers simultaneously present their teachership to students both visually and verbally in every lesson. Students perceive, experience, and interpret this presentation of teachership filtered through the social representations of teachership prevalent in the culture. Teacher presentations may foster, or challenge, existing social representations of teachership. When writing about the role of pictures in social representations research, de Rosa and Farr (2001) claim that changes in the pictures can lead to changes in social representations. Similarly, it is justifiable to think that pedagogically meaningful and appropriate visual expressiveness by teachers may contribute to more favorable social representations of teachership. Therefore, it is time to pay conscious attention to the role of teachers’ visual nonverbal expressiveness and its impact on learning. In addition, it is time to critically discuss whether teachers’ visual nonverbal expressiveness is consistent with the principles, ideals, and aims of contemporary pedagogy, as well as teachers’ own pedagogic vision. Open access funding provided by University of Eastern Finland (UEF) including Kuopio University Hospital. I wish to thank all the students and teachers who participated in the study. Beltman, S., Murdoch, C. G., Dinham, J., & Nguyen, B. (2015). Drawing identity: Beginning pre-service teachers’ professional identities. Issues in Educational Research, 25(3), 225-245. Retrieved from http://www.iier.org.au/iier25/beltman.pdf. Hedenus, A. (2016). Embodiment and materialization in “neutral” materials: Using audio-visual analysis to discern social representations. FQS Forum: Qualitative Social Research, 17(1), Art. 3. Retrieved from http://dx.doi.org/10.17169/fqs-17.1.2404. Miettunen, J., & Dervin, F. (2014).”The most respected teachers in the world”? Media representations of the Finnish teacher in treacherous times. International Journal of Education for Diversities, 3, 21–36. Retrieved from https://helda.helsinki.fi/handle/10138/232688. Minervini, I., & Fontani, S. (2003). Between difficulties and opportunities: The social representation of special support teachers. Review of Psychology, 10(1), 33–39. Retrieved from https://hrcak.srce.hr/2966. Sakki, I., Mäkiniemi, J.-P., Hakoköngäs, E., & Pirttilä-Backman, A.-M. (2014). Miten tutkia sosiaalisia representaatioita? [How to study social representations]. Sosiaalilääketieteellinen aikakauslehti [Journal of Social Medicine], 51, 317–329. Retrieved from https://journal.fi/sla/article/view/48478/14151.